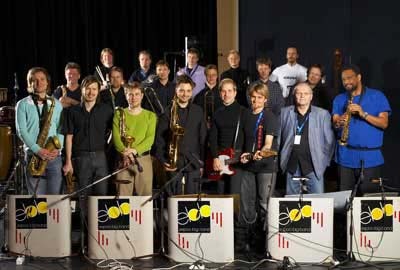 Founded in 1980 and conducted by jazz 'Georgie Award' winning musician Martti Lappalainen, the Espoo Big Band (EBB) has been on stage at a number of international jazz and arts festivals, including Detroit, Miami, New York, Montreux, Antibes, Budapest, Montpellier, Umbria, London, Paris and Wellington. EBB has also toured Australia (1998) and South America. Many jazz greats and soloists have performed with the EBB including o.a. Ray Charles, Billy Cobham, McToy Tyner, Trilok Gurtu, Freddie Hubbard, Slide Hampton, Diane Schuur, Art Farmer, Randy Brecker and Carla Bley. The beginnings of the EBB go back to the Tapiola Music School in Espoo (Finland), where experimental jazz education was lauched in 1968 by Martti Lappalainen. The EBB's forerunner, The Tapiola Big Band was founded in 1970, and it soon achieved name and fame in Europe by winning international contests and became known for its young, skilled players and ambitious concert programs. Composed of an average of 20 instruments, EBB tries to bring out in each presentation the best in each of its members, and it's why all musicians are used in solos, and such a band achieves an impressive harmony in its concerts, which is only possible due to the EBB's solid group spirit. Espoo Big Band -both classical and original - is not only an orchestra for jazz fans but for all music lovers. For its inaugural Asian tour in Nov/Dec 2006 EBB has prepared a repertoire of fine Finnish composers: Jukka Linkola, Sakari Kukko, Pekka Pohjola and Jarmo Saari. Espoo Big Band only plays music exclusively composed for it, making each concert a unique experience.